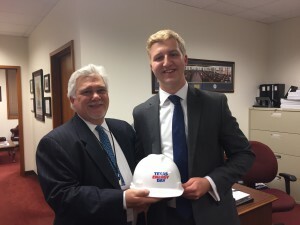 On March 22, 2017, Kevin Crowley, President & CEO, Forged Products and Bob Ryan, Deputy General Counsel, Stallion Oilfield Services led PESA’s delegation to the first-ever Texas Energy Day. About 500 participants from across the oil and natural gas industry descended on Austin to highlight to legislators, regulators and other key stakeholders, industry’s economic and employment contributions to the State. PESA joined with the Texas Oil and Gas Association (TXOGA) and 23 other associations to sponsor the event. The top industry issue for this legislative session is the reauthorization and proper funding of the Railroad Commission (RRC). Under Texas’s sunset review process, the RRC must be reauthorized every 12 years. Chairman Darby expects the House to move forward with reauthorization legislation next week. Operators with major presence at Texas Energy Day included Chevron, BP, Apache, Hess, ConocoPhillips, Anadarko, Shell and Pioneer. PESA Member Companies included Forged Products, Halliburton, and Stallion Oilfield Services. The event was a tremendous success as representatives from across the oil and natural gas industry came together with a unified voice to tell lawmakers how vital the industry is to Texas’ economy, environment and future. Plans are already underway for the next Texas Energy Day to be held March 2019 and we hope all PESA member companies will participate.